Kenya Wildlife Service is investigating the killing of two owls at Winners Chapel International in Nairobi. On Thursday last week, Pastor Patrick Ngutu from the church posted an image on social media of a dead owl that had been killed in the church’s compound. According to Ngutu, the owl was the second to be killed on the same day. 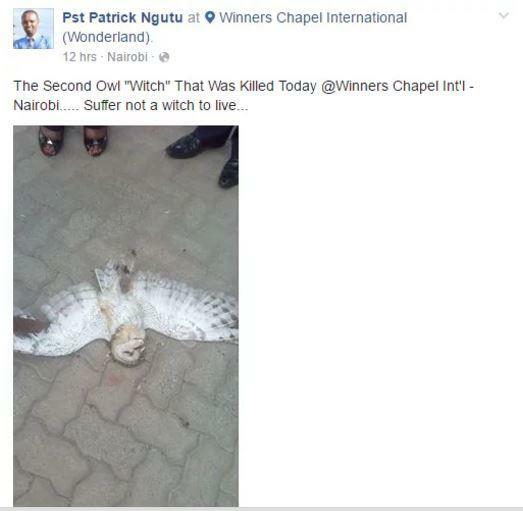 “The second owl “witch” that was killed today @winners chapel int’l Nairobi… suffer not a witch to live…” the photo was captioned on the church’s Facebook page. The church quickly deleted the post but not before the screenshots had been taken and shared on the internet. The Kenya Wildlife Service reacted to the reports on twitter urging those with information on the incident to notify the office through its hotline. According to the Kenya Wildlife Act of 2014, the church could part with Sh2 Million for the killing of the birds. Hunting and killing any mammals, birds, and sea shell attracts a fine of Sh1 Million or a two-year imprisonment. The Winners Chapel is located less than a kilometre from the Nairobi National Park, a factor that could explain the presence of the two owls at the church.